Now you’re in a panic and thinking, “What can we do for fun? Where can we go to make their visit memorable?” No fear, SoIN is here with ideas on where and how you can experience holiday fun with loved ones. If you want a traditional holiday meal, Joe Huber’s Family Farm and Restaurant serves its Thanksgiving dinner every day during November! The meal includes: turkey, dressing, cranberry relish, fried biscuits with apple butter, waldorf salad, real mashed potatoes, green beans, corn, and candied sweet potatoes. 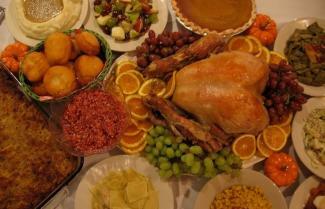 On Thanksgiving Day, enjoy a buffet with the same favorites. Be sure to call ahead for reservations: 812-923-5255. So, sometimes you just want to order in and stay by the cozy fire with your loved ones. We totally get that! If your guests or visitors have a hankering for something besides turkey during the holidays, we’ve got the solution. Did you know Buckhead Mountain Grill now delivers its catering menu FREE ($250 and over order) in Clark and Floyd counties? Just picture the happy faces enjoying a fajita or nachos bar, pastas, or a family-style meal of roast chicken, pot roast, or meatloaf. If you change your mind and decide to go out, Buckhead does have a cozy fireplace at their Jeffersonville location. 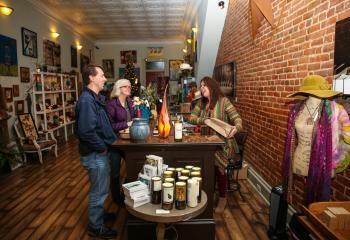 SoIN downtowns simply sparkle during th e holidays. From shopping at boutiques and shops, sampling candies and wines, to trolley rides and Christmas lights, a stroll through downtown Jeffersonville, New Albany, and the town of Charlestown is magical. And that’s what Schimpff’s Confectionery and Candy Museum’s candy-making is. Pure magic! Every day is like a holiday at this 126-year-old candy-lover’s dreamland. Imagine how happy your guests will be, sampling warm cinnamon red hots and hand-dipped chocolates after the Schimpff’s staff makes them. On the Friday and Saturday after Thanksgiving, November 24 and 25, watch Warren and Jill Schimpff make candy canes and ribbon candy for the holiday season, using the same copper kettle and roll molds that founder Gustav Schimpff used in 1891. Take your holiday visitors out for a “night on the town” to enjoy a concert at the Ogle Center or a Broadway-style musical at Derby Dinner Playhouse while they’re here. On November 21, Ogle Center presents, “It’s a Wonderful Life: Live from WVL Radio Theatre.” It’s a unique and nostalgic adaptation of Frank Capra’s beloved film. The Ogle Center hosts other concerts and events during the holidays, so be sure to check our website calendar. For more than 40 years, Derby Dinner Playhouse has entertained families with professional productions of Broadway musicals and children’s theatre. This year’s holiday productions will be fun, lively, and lavish in classic Derby Dinner style. Beginning November 15 and showing through New Year’s Eve: “A Christmas Carol, the Musical.” Based on the classic Charles Dickens story of Ebenezer Scrooge, the tale is brought to life in a new and whimsical way with this 1994 adaptation. 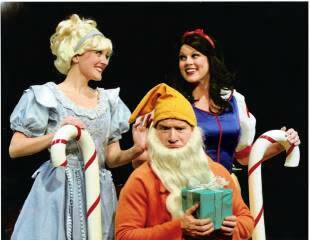 “A Fairy Tale Christmas” premieres at Derby Dinner on November 18 and features classic fairy tale characters the children will love. Children are treated with a scrumptious breakfast or lunch before each performance. Tickets are available by phone: 812-288-8281 for both Derby Dinner productions. The holiday season is just beginning! 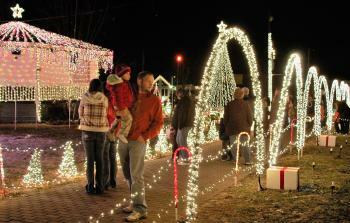 We hope these ideas help you and your visiting loved ones create lasting holiday memories in SoIN. Be sure to check our events listings for other holiday events.